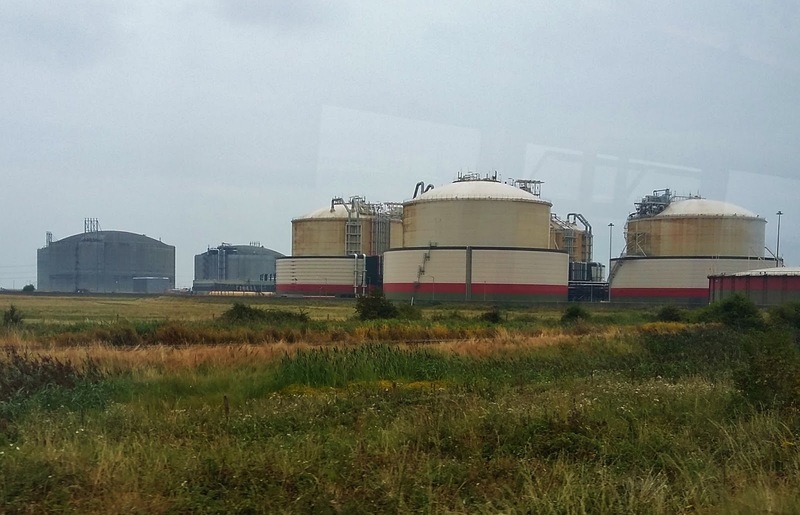 Not too far to go today, so I enjoyed the luxury of a late (10.10) start on an Arriva bus to the Isle of Grain. Not, strictly speaking, an "island" and accessible only by "out-and-back" but it looked an interesting place on the map, with a large flat agricultural area followed by an intense industrial conglomeration at the far end - and beyond that the tiny village of Grain itself. For once, I didn't mind having to return immediately and on the same bus - Grain turned out to be completely unremarkable, although the complex of Gas-powered power stations and associated gas storage tank farms was fascinating, from the bus. 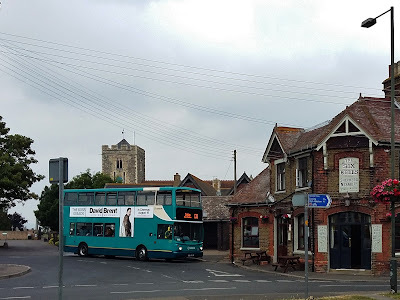 Although the other buses we passed on the route to and from Grain were double-deckers, ours was only a small single-deck, which was almost full by the time we got back to Strood, where I alighted. Although only just across the River Medway from Rochester, Strood is another world - much more like the rest of the workaday Medway Towns, but it did have a cafe where I got a reasonable lunch that I'd have paid twice as much for over the river. The bus terminus at Cliffe. I was rather a glutton for punishment today as after an hour or so in Strood I went back on to the Isle of Grain, this time to the village of Cliffe. Much more rural than its neighbour and for once the nicest and most rural bits were around the bus terminus! I was able to avoid another out-and-back from Cliffe by virtue of the three-times-a-day service on to Gravesend, for which I had only half-an-hour to wait. Although my plan was to stay the night in Gravesend it was only early afternoon, so I was able to continue over the Thames on the eleventh ferry of the trip to Tilbury and then on to Grays on the Essex bank of the estuary. Although this would mean having to return the same way I didn't mind. Gravesend looked a (slightly) better place to end this section of the trip and it would save me a lot of time on the next portion when I'll be able to re-start at Grays. Despite it being Friday afternoon the ferry wasn't very busy. Gravesend would at one time have been a magnet for shoppers and perhaps workers from Tilbury at one time but nowadays I suspect they mainly go to the out-of-town shopping complex at Lakeside instead. There was another of the rare British examples of transport co-ordination at the Tilbury ferry terminal where a bus meets - and waits for - the ferry. 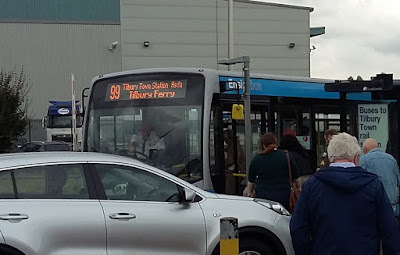 Unfortunately it only takes you up into Tilbury itself, where another, less well-organised connection is necessary to reach anywhere useful. The 99 bus does however provide one other function - acting as a "parliamentary" train for the railway station at Tilbury Riverside. This station has not been served by train since 1992 and there's no obvious sign of it now, but to save all the fuss and expense of closing it officially the railways still pretend it is open and will happily sell you a ticket to it from anywhere in the country! These fares are still available and still used. In fact one passenger boarded the 99 at Tilbury Town station with a rail ticket, which the bus driver cancelled by scrawling over it in biro in just the same way as railway conductors do today. From Tilbury I completed this stage of the odyssey on a local bus to Grays, where I spent about 15 minutes in the bus station before returning via the same route to Gravesend. The trip will be continued in September.